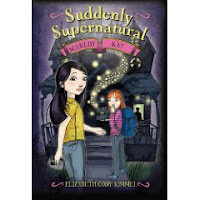 GreenBeanTeenQueen Says: I couldn't find a summary online anywhere, but the story revolves around Kat, who is a psychic, and in middle school. The first book in the series, School Spirit was one of the first books I reviewed for TeensReadToo.com, so this series holds a special place in my heart. About the Book: (From Amazon) Dylan Shoenfield is the princess of L.A.’s posh Castle Heights High. She has the coolest boyfriend, the most popular friends, and a brand-new “it” bag that everyone covets. But when she accidentally tosses her bag into a fountain, this princess comes face-to-face with her own personal frog: selfprofessed film geek Josh Rosen. In return for rescuing Dylan’s bag, Josh convinces Dylan to let him film her for his documentary on high school popularity. Reluctantly, Dylan lets F-list Josh into her A-list world, and is shocked to realize that sometimes nerds can be pretty cool. But when Dylan’s so-called prince charming of a boyfriend dumps her flat, her life—and her social status— comes to a crashing halt. Can Dylan—with Josh’s help—pull the pieces together to create her own happily-ever-after? GreenBeanTeenQueen Says: Ok, doesn't that plot sound like a fun 80's romantic comedy? Since I'm a sucker for old movies and romantic comedies, this book just sounds like so much fun. Plus, I love anything with geeks. About the Book: (From Amazon) Seventeen year old Lady Alexandra is strong-willed and sharp-tongued -- in a house full of older brothers and their friends, she had to learn to hold her own. Not the best makings for an aristocratic lady in Regency London. Yet her mother still dreams of marrying Alex off to someone safe, respectable, and wealthy. But between ball gown fittings, dances, and dinner parties, Alex, along with her two best friends, Ella and Vivi, manages to get herself into what may be her biggest scrape yet. When the Earl of Blackmoor is mysteriously killed, Alex decides to help his son, the brooding and devilishly handsome Gavin, uncover the truth. But will Alex's heart be stolen in the process? In an adventure brimming with espionage, murder, and other clandestine affairs, who could possibly have time to worry about finding a husband? Romance abounds as this year's season begins! GreenBeanTeenQueen Says: I've been seeing this book around the blogging world and the cover alone is enough to make me want to read it. Since I'm currently addicted to The Luxe series, this books sounds like it will be just about perfect! What are you wanting this Wednesday? the first one sounds really cute!! i love books that deal with psychics and whatnot. I actually have that Scaredy Kat book in my review pile! Lauren-The first book was pretty cute and I really liked Kat's character.